Welcome to the 2011 Holiday Edition of The Gluten Free Nomad, where you'll learn about new Pages and Recipes posted at Gluten-Free-Around-The-World.com. There's also a Super Easy Recipe for Almond Crescent Cookies made with almond paste, and a holiday half price offer, extended through the end of December. What's happening at Gluten Free Around The World? Holiday Baking can be challenging when you're gluten free. If you are a cookie lover, and/or baker, I think you'll appreciate these new pages and recipes. #1) An Updated Gluten Free Christmas Cookies Page, which now includes a long list of Christmas cookies from many countries, that are already gluten free. #2) Discovering the Almond Cookie. A new page that surveys the range of almond cookies from around the world. #3) A Gazillion Almond Paste Cookies. Many types of almond paste cookies, from many countries. #4) A Recipe for Niçois Suns. These almond Thumbprint Cookies from France are kid approved and fun to make. This is made from prepared almond paste. Make sure you check labels if you purchase almond paste, as some have gluten in them. Ingredients are in bold. Extra powdered sugar for dusting is optional. Soften 1/2 pound almond paste with your hands or a food processor. Divide dough in half, and roll each half into 9 inch long rolls. Cut into 3/4 inch pieces, and roll into balls. Spread out 1/2 C sliced almonds on a sheet of waxed paper, roll the pieces in the almonds, and shape into crescents. Place on cookie sheets and let them rest 20 minutes. Place the paper sheets on a damp cloth and allow the cookies to cool, then remove from the sheets. For a limited time, until December 31st, I'm offering the Gluten Free Cakes eBook for only $4.97, less than half price, to subscribers of this ezine. Did you like the free eBook? This one is even better. Know any cake lovers? The holidays are a wonderful time to try new things, and baking traditional cakes from other traditions can be a lot of fun, especially when you have willing tasters! Come back here and click this link to get your discount . But don't wait, this really is a holiday discount. I'm not sure how long the offer will be available. 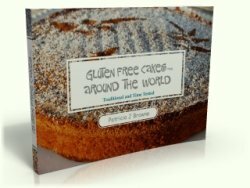 This Gluten Free Cakes eBook offer is available to anyone signed up for this free E-zine. So if you know someone who would like it, please invite them to come over to the site and sign up by copying this link and sending it to them in an email: http://www.gluten-free-around-the-world.com/gluten-free-nomad.html Be sure to let them know that subscribing is free.